Artsplace was a champion on the racetrack and in the breeding shed. Harness racing’s champion two year old in 1990, Artsplace notably set a world record for two-year-old pacers by winning the Breeders Crown in a time of 1:51.1 at Pompano Park in Florida, soundly defeating champion Die Laughing. His three-year old campaign was marred by injuries, though he still earned over $900,000 and won several major stakes races as he battled it out with Die Laughing and Precious Bunny. Fully healthy, Artsplace had an outstanding four-year-old season and was honoured as Horse of the Year for 1992. Under the care of trainer Bob McIntosh, he went undefeated and won such races as the Breeders Crown, US Pacing Championship, and American National. 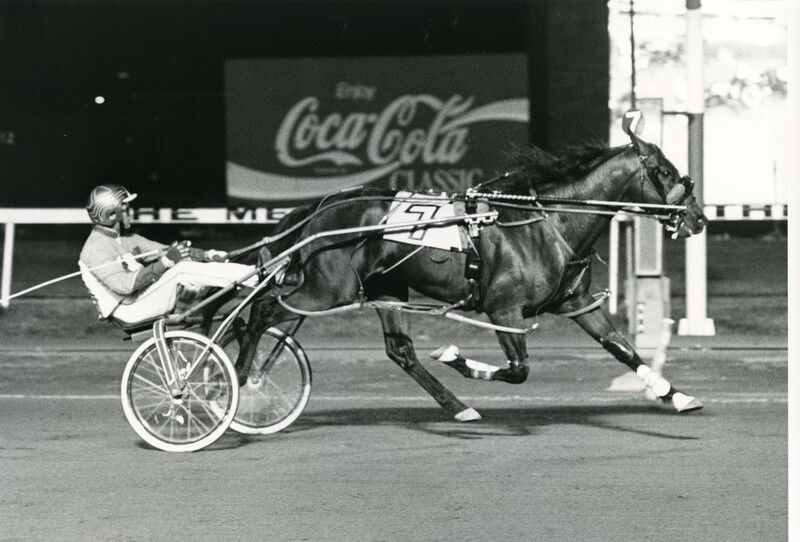 Driven throughout his career by Hall of Famer John Campbell, Artsplace paced a mile in 1:49.2, which was at the time the fastest race mile in harness racing history. Artsplace entered the breeding shed with a lifetime summary of 49 37-7-1 and $3,085,083 in earnings. He retired as the second-richest pacer of all time, and set at least one world record in each of his three years of competition. At stud, Artsplace was a producer of top horses from the time his first crop raced in 1996. He regularly dominated the breeding statistics for several years, with his progeny earning $115 million until his death in 2006. To date, his progeny, including 18 millionaires, have accumulated over $173 million in earnings with an average of $126,372 per starter. Artsplace sired numerous champion horses, including millionaires Artiscape, Art Major, Worldly Beauty, Galleria, Grinfromeartoear, Art’s Conquest, Astreos, Arturo and Glowing Report, among many others. Many of Artsplace’s sons and daughters have gone on to sire champions themselves, including most recently Art Major, who sired 2008 Meadowlands Pace champion Art Official, winner of the 2008 Pace in 1:47 which was, at the time, a world record time for three year old pacers and the second fastest race mile in harness racing history. Artsplace was euthanized at the age of 18 due to complications of laminitis, which he had been suffering with for some time.